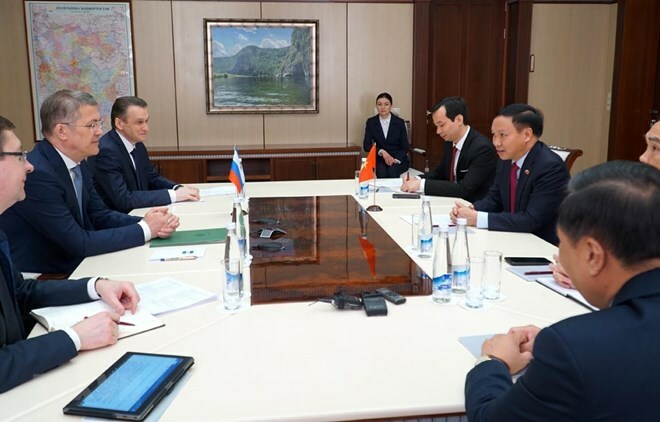 Hanoi (VNA) – Vietnamese Ambassador to Russia Ngo Duc Manh held a number of meetings with authorities of the Republic of Bashkortostan (Russia) in Ufa capital city on March 23 to enhance legal regulations for the over-1,000-strong Vietnamese community there. His visit was made on the occasion of the 100th founding anniversary of the Republic of Bashkortostan. Tran Ngoc Tuan, Chairman of the Vietnamese Association in Bashkortostan, said the Vietnamese community was born over three decades ago and has so far welcomed third generation. It is seen as one of the most stable and prosperous communities across Russia. However, issues regarding adaptation to legal amendments, especially in immigration, remain. Dmitry Tyrykin from the Head of Bashkortostan’s Protocol Department said Bashkortostan targets leading Russia in terms of cooperation with Vietnam, especially in oil and gas. Vietnam has sent students to the Ufa State Petroleum Technological University while Bashkortostan also has provided Vietnam with equipment used in oil exploitation. The university has recently inaugurated a Vietnam traditional room – a symbol of cooperation between the two sides. During a reception for Ambassador Manh, acting Head of Bashkortostan Radiy Khabirov suggested further tapping potential of bilateral collaboration, particularly in tourism. Speaking highly of Vietnam’s business achievements, Khabirov said Bashkortostan is developing economic ties with foreign countries, including Vietnam. Manh pledged to do his best to serve as a bridge for bilateral partnership. He proposed issuing more open regulations to attract tourists as well as incentives for Vietnamese nationals living in the territory. During a working session with Irina Kegina, who is in charge of immigration at the Bashkir Ministry of Internal Affairs, Manh asked her to review several cases involving Vietnamese migrants. She promised to build specific legal documents for Vietnamese nationals aspiring to live there, adding that any Vietnamese nationals, who abide by law, have stable jobs and meet other legal requirements, will not meet any obstacles to fully integrating into the local society.